The house has two access roads, from the main road or from the ancient hamlet through a very characteristic brick staircase and an ancient iron door latch. You enter a rustic living room with ancient bricks, very bright. In the room there is a sofa bed in front of the fireplace for pleasant moments of relaxation, from this room you access the terrace with a beautiful panorama on the Umbrian countryside. From the living room you can also access the kitchen, delightfully furnished with restored and rustic furniture. In the kitchen there are crockery, plates, glasses and every other useful tool in the kitchen. There is also a traditional electric oven. From the living room a picturesque wooden and iron staircase leads upstairs where there are 2 bedrooms, one with twin beds and one with double bed. The latter with walk-in wardrobe and a balcony overlooking a stunning whitewashed panorama. There is a bathroom with shower on both levels. To the 4-bed there are another 2 sleep sofa places for a total of 6 beds. The house is very fresh in summer and warm in winter, thanks to the fact that it is inside the ancient walls of a castle. The bar, the tobacconist / newsstand and the supermarket are within walking distance of the house. We recommend our guests with children to visit one of the oldest forests in the world, the enchanting fossil forest of Dunarobba, at Avigliano Umbro, dating back about 3 million years ago. For couples, after going to the nearby Valentine's Basilica in Terni, we recommend stopping at the Marmore Falls, where you can admire at sunset the fall of the water by 165 meters high! bathroom with sink, bidet, toilet and shower complete with hair dryer and towels. toilet paper will be provided to every change of linen. These are our recommendations to ensure you and the guests who come after you a pleasant stay in Casa Iolanda and trouble, respecting the neighbors and the house. - Energy savings: Avoid leaving appliances switched on when not in use and when you leave the house, making sure in particular that all the lights are off. - Do not leave the fireplace if you're in the house. Assentarti or shut it down before you go to bed. Do not burn the waste and flammable things but uses only wood in small amounts at a time. Away things or rugs that could be damaged by the fire sketches. Always use the special cast-iron handles and attizzafuoco supplied. Manage always fire with extreme caution. - Avoid harassment noises loud music from 23. 00 to 8. 00. - Check if the gas is closed when you leave the house. - Use correctly the structures of the house, the furniture and furnishings provided (kitchen, pots, etc. Our stay at Nicoletta's home in Casteltodino was wonderful. We stayed there as a base house for our three week stay in Italy. It's proximity to Rome and other popular cities is perfect (Todi, Orvieto, Assisi, Spoleto, Bavagna, etc) . What's nice is that after fighting the tourists, returning to a quiet environment was quite relaxing. The house is appointed well with all the amenities needed for a comfortable stay. Although there is no air-conditioning (most homes in Italy aren't), the breezes from the Umbrian countryside cool the house down well and is most comfortable to sleep in. There was one issue with the washing machine, but Nicoletta and her mother, Oretta, had it repaired in less than 24 hours! We stayed in two other homes on our visit to Italy (one in Venice and one in the Cinque Terre) and I have to say that this house was our favorite. From the TWO decks in the home, the evening views of the Umbrian countryside were spectacular and very peaceful! The people of Casteltodino were warm and accommodating, and there were even young children there whom my two sons made quick friends of. 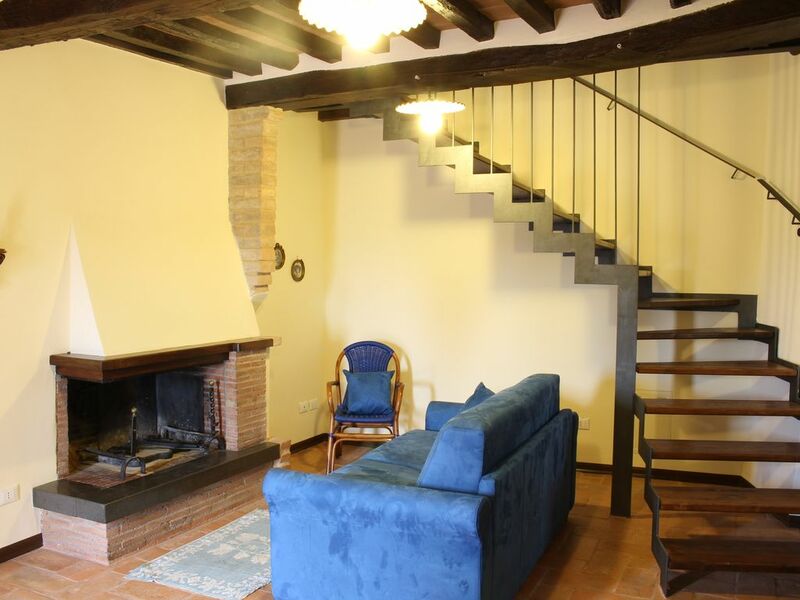 I would not hesitate to stay there again, and I encourage anyone looking for a nice home to live in for an extended time in Italy to consider this one. Thank you Nicoletta and Oretta. Best wishes to Ken, Scarlet, Bryton, Shayler. We loved staying at the apartment. We picked this location because of the easy access to other areas such as Spoleto, Todi, Spello, Assisi. For the price it is very well set up. Lots of space. A beautiful kitchen. Large living room. Great balcony. If you have children there is another room with two beds. We loved retiring here in the evening after exploring the local areas. Old thick walls keep the rooms cool even when it is hot. Nice place to chill. Plenty of space and everything you need is there. it's been a pleasure to host you and It'been nice meeting you. We are happy to know that you have been well. We really enjoyed our stay in Castel Todino with its wonderful setting. The house is lovely and quiet with beautiful furniture, floors and ceilings. Everything was very clean and we found everything we needed. A small supermarket is close by. Nicoletta is really nice and everything functioned smoothly. Highly recommendable! Gentilissima la proprietaria, caratteristica e tenuta benissimo la casa e molto caratteristico il borgo in cui è inserita. In una posizione perfetta per visitare vari borghi vicini, come Narni e San Gemini, una vera perla! Nora e la sua famiglia sono stati molto precisi ed ordinati, la casa è stata lasciata perfettamente pulita. Grazie mille Nora, è stato un piacere ospitarvi. Tornate a trovarci! Esperienza breve, ma intensa, in poche parole siamo stati benissimo. Casa accogliente, pulita, ordinata, dotata di tutto quello che potesse venire incontro alle nostre. Fresca e piacevole anche in pieno agosto. Un nido confortevole in cui tornare dopo le lunghe gite tra le meraviglie dell'Umbria. Costi pagabili in loco. Non compresi nel prezzo d'affitto: Legna da ardere: € 5,00 al giorno Lenzuola; Incluso Asciugamani; Incluso Biancheria da cucina; Incluso Elettricità/Energia; Incluso/a. Wifi a richiesta con possibilità di costi aggiuntivi Tasse di soggiorno; No Culla per bambini: su richiesta Pulizia; Pulizia extra su richiesta € 10 /ora da corrispondere direttamente all'addetta Bambini da zero a 3 anni se dormono con i genitori nel letto non pagano. Da 3 a 6 anni pagano il 50% della quota adulto.Dal compimento del 6° anno pagano la quota giornaliera intera.